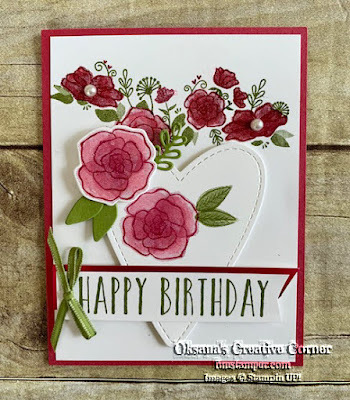 Today I would like to share simple and elegant card using Forever Lovely bundle. I am a big fun of any floral sets and this one is not an exception. We made this card at my wine class and then I made more of them using different sentiment. Die cut large (skinnier) heart from 3 x 4 whisper white piece. 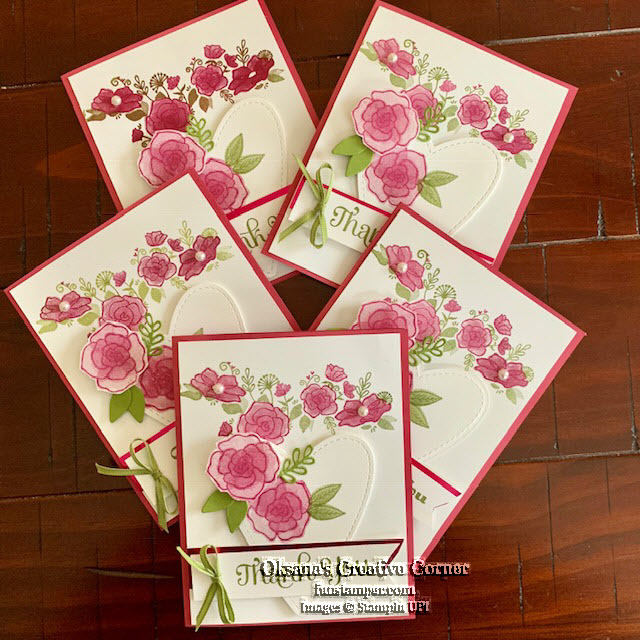 Stamp flower in top left corner of the heart and another one on whisper white scrap. Stamp 2 leaves in old olive next to the flower on the heart. Die cut 3 leaves from the old olive scrap; die cut stamped flower. Stamp greeting on the ¾ x 4” whisper white in old olive. Flag the right side. Flag piece of foil. Adhered greeting to foil slightly overlapping. Adhere heart to the card front with dimensional, add greeting on top of it. Adhere die cut flower next to stamped one with dimensional, add leaves with glue dots. Add 2 pearls to the large flowers and old olive bow to the left side of the greeting.